After over 4 weeks of no updates, I thought that I should at least make some sort of attempt to update this web blog, and I actually have a lot to write about now since I have been places.. hehe.. 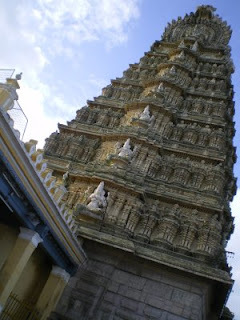 So yeah, I will start of with my adventures in Mysore that happened just over 3 weeks ago. 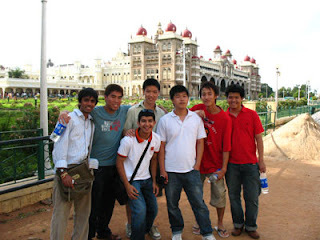 So me and a couple of friends, or should I say work colleagues took a taxis and the first stop was Mysore Palace. We arrived outside the palace and the first thing that we experienced was a mob of Indians that came over to us to sell over-inflated merchandises. They try to sell like a paper fan for 500Rs, which is around £7. Ok that might not sound like a lot, but in India that is one hell of a lot of money for a paper fan that didn’t even work properly. But anyway, back to the palace. The palace which you can see above is spectacular. 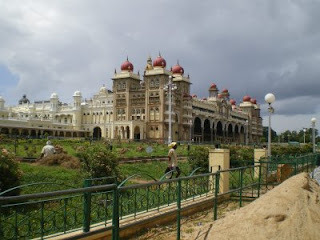 It was built around the 1890s and I think it was the first place in southern India to have electricity. Well I am kinda bad at remembering stuff so don’t quote me on that. We hired a tour guide to bring us around the palace and it was quite interesting. They had a lot of paintings that were suppose to have a “3D” effect, as in the objects on the painting will look different if you look at it on different angles, but I never could see it. May be I am just blind or something. Also they had statues that looked different when looking at different angles, and these I could see quite easily. I wish I took some photos, but we were not allowed to take cameras into the palace, so you just have to trust my word on this. Oh yeah, a couple of my friends were nearly pick pocketed inside the palace by these two little rascals, but thank god my friends were aware enough to notice it and after the kids ran away towards their parents crying, ok not literary ran to their parents, but they did run away.. LOL.. Anyway, here are a couple more photos of the palace. 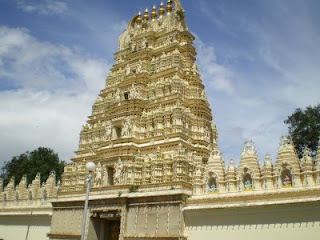 After we completed the palace, we decided to go up to Mysore mountain (or hill), called Chamundi Hill. This hill is the highest summit in Mysore and I think if I am not mistaken that this hill holds to clue on why Mysore was called Mysore. If I remember there was a monster that was named Mysore on the top of the hill and their was a princesses that needed to be rescued or something, and well that’s all I remember the story.. remind me to listen more clearly when people are actually telling me stuff.. LOL. 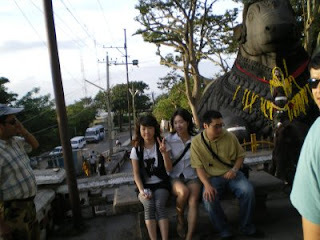 Anyway, on the hill there was just a temple so yeah it wasn’t anything special but it was nice and relaxing up there. People still try to sell us dodgy crap for well over its value, but it wasn’t as bad as it was in the palace. 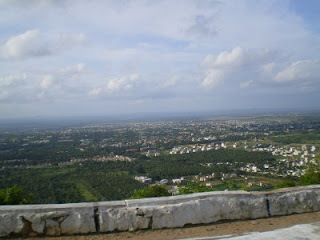 Below are some of the photos of the palace and also views from the top of the mountain. 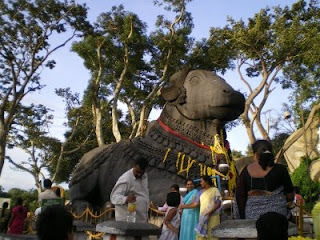 After finishing the mountain, we decided to go for dinner, but as well descended the hill we came across this cow statue thingy. I have no idea what it was though, but it looked interesting. We also saw some Japanese girls, and pete or one of the guys with us wanted a photo, or someone wanted it done forgot who, anyway.. the below are the photos of the cow status and.. why not, a photo of the Japanese girls.. LOL. Anyway, after the cow statue thingy, we decided to head for dinner at a restaurant called Park Lane. 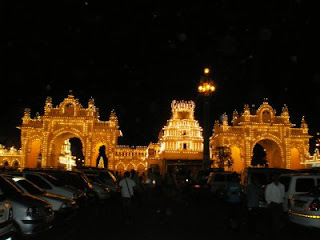 But before we did that, we decided to head back to Mysore Palace, because every Sunday (we went to Mysore on a Sunday by the way.. LOL), they switch on the lights. 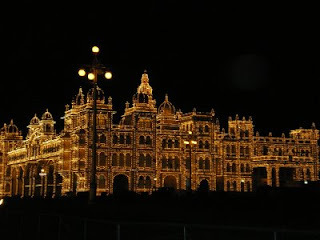 It was amazing to see the palace lit up at night. It looks completely different to what it does in the day time. 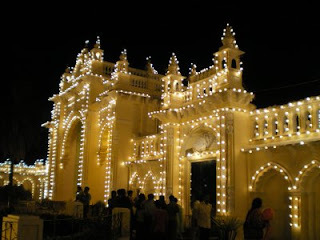 The lights gets switched on for one hour between 7-8pm and it cost 100,000Rs just to light it up for that amount of time. They used to do it between 6-8pm but I think it cost too much and also if there is a power cut, it will eat up the generators, LOL. Oh yeah, out of context we do get a hell lot of power cuts, but usually the main stuff are backed up by dedicated generators. Anyway, here are some picks of the Palace at night. After that, we finally went to park lane hotel to have dinner. 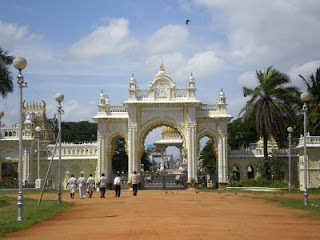 The food I have to say was pretty incredible, probably the best in Mysore. And we only paid like £4 per head and this was like 2 starters, lots of main course and also a dessert. We also paid for our taxi driver as well, so it is pretty cheap to eat. Anyway, that is about it to the day, I am pleasantly surprised that I actually remember a lot considering this was like 3 weeks ago. There are more places that I have to do updates for and hopefully I can get them done soon. But for now I am quite tired writing all this out, so I will say goodbye.